All transactions are safe and secure with a reliable history in online purchasing behind each of our associates. 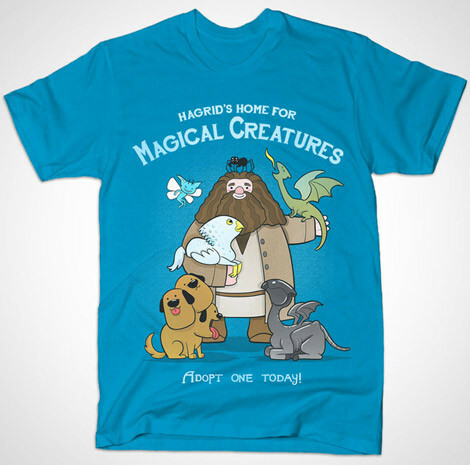 Buy the Hagrid's Home for Magical Creatures t-shirt to own Harry Potter clothing and merchandise. Get your hands on one of the most artistic and fun Harry Potter shirts in our selection. The Hagrid's Home for Magical Creatures tee features Harry's friend Hagrid surrounded by a number of well-known magical creatures. The half-giant wizard Rubeus Hagrid is the gamekeeper of Hogwarts who eventually becomes the Care of Magical Creatures professor. He is a mentor to Harry Potter and his fellow students. It's perfect for both geeks and Potterheads. Wear it as you read one of the Harry Potter books, perhaps Harry Potter and the Deathly Hallows, an international bestseller. In addition to the Hagrid's Home for Magical Creatures tee above, browse the Harry Potter Clothing Gallery for more apparel like men's and women's clothes, kids shirts or hoodies.